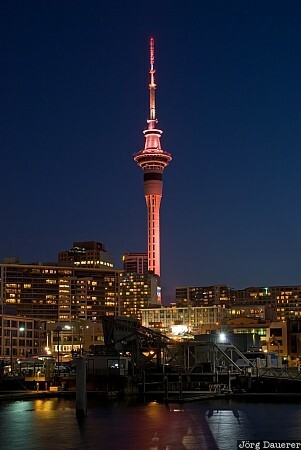 With 328 meters the tallest free-standing structure in the Southern Hemisphere: The Auckland Sky Tower at night seen from Viaduct Harbor, Auckland, on the north island of New Zealand. This photo was taken in the evening of a sunny day in October of 2008. This photo was taken with a digital camera.